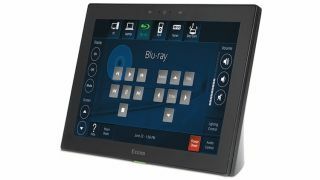 The What: Extron Electronics has begun shipping the TLP Pro 1025T 10-inch Tabletop TouchLink Pro Touchpanel. The What Else: Extron redesigned this latest touchpanel inside and out with a new quad-core processor, eight times more memory, a higher resolution, 1280x800 capacitive touchscreen built with scratch- and smudge-resistant Corning Gorilla Glass, and a distinctive enclosure with a gracefully sweeping back. "We designed these new TLP Pro 1025T touchpanels with a number of significant enhancements in both performance and style," said Casey Hall, vice president of sales and marketing for Extron. "We boosted processing power, memory, and graphics, then wrapped it all in a sleek enclosure that simply looks stunning." The TLP Pro 1025T was engineered with an eye to the future. With its improved graphics engine, quad-core processor, and increased RAM, it enables faster background graphic loads and crisper page flips, according to the company. These performance enhancements offer an enhanced user experience now while providing ample memory and processing power to support new features and capabilities in the future via firmware updates. All TouchLink Pro touchpanels can be customized using Extron GUI Designer software. This interface design software offers ready-to-use templates for a wide variety of rooms and presentation environments.